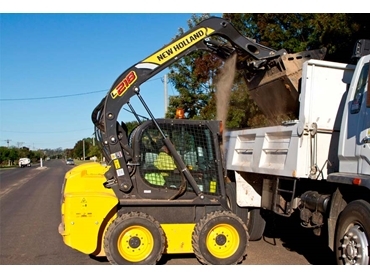 New Holland 's L218 skid steer played a key role in flood preparation works. Hay-based contractor, Mark Biggs, moved hundreds of cubic metres of black clay during March in a bid to protect local houses from rising water from the Murrumbidgee River floods. His new New Holland L218 skid steer loader played a pivotal role, allowing him to move more clay in less time to get the protective banks in place before rising waters reached the houses. "We knew the floods were coming six weeks prior, so I spent quite a bit of time in the lead up building banks around houses in the area, including my own,” said Biggs, whose Riverbrae Holdings Pty Ltd business is based at Hay in the western Riverina area of New South Wales. “My latest acquisition, a New Holland L218 skid steer loader, played an integral role and was put to work building banks up to 1.5 metres high on the perimeter of properties situated close to the river." "The banks were made from black clay, which is the only material that will seal out the water. I built six triangular banks of various lengths. They were about three-metres wide at the bottom and 1.5 metres wide at the top. When you add it all up, that’s a lot of clay that needed moving." The L218 boast the industry's leading cab when it comes to width, with more head and shoulder room than any other skid steer on the market. "I have always found New Holland cabs to be comfortable and it’s this feature that keeps me coming back with every upgrade. Given that I could spend up to 10 hours a day in the cab, being able to finish work and still feel fresh really makes a difference," said Biggs. According to Biggs, the L218 is now being put to work on other tasks including boring holes, to trenching and clearing residential sites. "I imagine we will also be doing some flood repairs for the local council and local residents some time down the track." "We may also have to rebuild some of the banks that failed during the recent floods.” Excellent visibility is assured in the New Holland skid steers, with the threshold for the front door on the 200 Series lowered, allowing for even better sightlines to the loader bucket." "When I am working on residential sites, I am quite often operating in tight spaces with people around me, so the L218’s visibility becomes important for occupational health and safety reasons. The cab door is glass so even when it’s closed, I feel a sense of space from inside the cab."